Colonel Thomas B. Felder yesterday requested that the grand jury make an early investigation of the affidavit submitted by George Gentry in which he declared that the dictagraph records were padded. On Friday afternoon he forwarded a letter to L. H. Beck, foreman of the jury, in which he asked that body to look into the matter as early as possible. 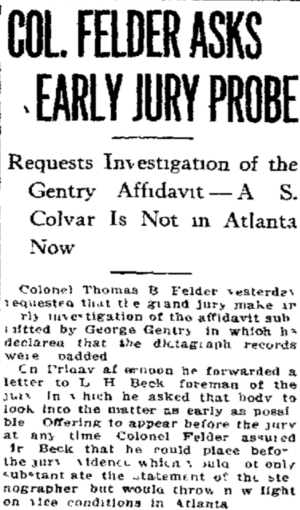 Offering to appear before the jury at any time, Colonel Felder assured Mr. Beck that he could place before the jury evidence which would not only substantiate the statement of the stenographer, but would throw new light on vice conditions in Atlanta. Colonel Felder also informed the jury foreman that at any moment he could bring George Gentry before that boy to give his testimony. Gentry, he said, was ready and willing to come back to Atlanta. While Colonel Felder stated that he was in daily communication with Mr. Gentry, the detective department is not so fortunate. Chief Lanford, having so far failed to locate the youth in Washington, where he is living under an assumed name and working for a business house there. Coincident with the proposed investigation of the dictagraph charges is the absence of A. S. Colyar. Colyar could not be found Friday or last night. At the Williams house where he lived while in the city, he was said to have left town with instructions to retain his room for future occupancy. The clerk of the hotel said that he did not know of the man’s whereabouts or when he was expected to return. Colyar, he said, had not told of his destination upon leaving several days ago. It is reported that he has gone to Washington to locate Gentry the stenographer and ascertain whether or not his sensational affidavit was correct. Another rumor is that he is in Cartersville, Ga., his home to which his wife returned several days previous to his departure. Chief Lanford, with whom Colyar has been closely associated during the latter’s sensational operations in Atlanta, said that he did not know where Colyar could be located or whether or not he was in or out of the city. Others with whom Colyar has been connected say they do not know of his whereabouts. He was seen as late as Saturday night. Efforts to find him in Washington have been to no avail. “I will welcome an investigation by the grand jury or any other tribunal,” Chief Lanford said, “and so will all the members of the detective department. We will all be completely exonerated when the charges are given complete airing. Such an investigation will serve only to act as a boomerang for its instigators. “I am trying daily to find Gentry. So far he has eluded us. If we can find him, I am confident the truth will be ascertained. In the first place, I doubt the genuineness of the affidavit he is purported to sign. In the second, if he did sign such a paper, he was persuaded to do so by some unfair means. Let the investigation proceed. I am as anxious as anyone concerned for it to come.